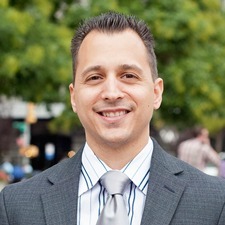 Geoffrey has been a hardworking, results-driven New York City real estate specialist since 2006. He has sold properties throughout Manhattan and Brooklyn, specializing in the Upper East Side. He strives to seamlessly find the perfect home for his clients and qualified buyers for his sellers. Extremely diligent and attentive, Geoffrey treats his clients with the utmost care, consideration, and advocacy. Clients praise him for his outstanding service, extensive market knowledge, honesty, and energetic, humorous personality. Originally from Brooklyn, Geoffrey’s undergraduate studies were in Psychology, which gave him a strong foundation in understanding people’s individual needs and what motivates them. No matter the lifestyle or budget, Geoffrey is a strong communicator who ensures his clients reach their goals. In his free time, Geoffrey serves his community as part of the National Alliance of Mental Illness' annual fundraising walk, and as a volunteer for God's Love We Deliver. His other activities include reading, Muay Thai kickboxing, weight training, and handball.